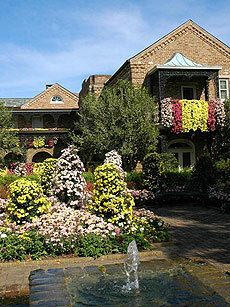 Founded in 1932 by Walter and Bessie Bellingrath, Bellingrath Gardens and Home is one of the top display gardens in the United States. The Gardens feature more than 65 acres of year-round blooms. The Bellingrath Home, built on the Fowl River, is filled with priceless antiques and the Bellingraths' original furnishings, and has been featured on A&E's "America's Castles" series. The Delchamps Gallery boasts the nation's largest collection of Boehm porcelain. Bellingrath Gardens and Home is in south Mobile County, a short drive from Dauphin Island and other beautiful Gulf Coast beaches. Nearby cities and attractions include Mobile; the U.S.S. Alabama Battleship; Fairhope; Gulf Shores; Orange Beach; the National Naval Aviation Museum in Pensacola; Biloxi; and New Orleans. Cafe and Gift Shop on premises. Group Rates: Available for tour companies and for groups of 20 or more. Contact Bellingrath for details. Hours of Operation: Open Year Round, 8:00 AM to 5:00 PM. Closed on Thanksgiving, Christmas and New Year's Days. Seasonal Dates: Open Year Round. Closed on Thanksgiving, Christmas and New Year's Days. Seasonal Hours: Magic Christmas in Lights Hours: 8:00 am - 9:00 PM. Extended hours begin on the day after Thanksgiving and continue through New Year's Eve. Deposit and Payment Policy: Payments must be made together by the group representative. A $100 deposit is required for all tours that include cafe meals. Cancellation and Refund Policy: Cancellations are require 48 hours in advance. Deposits will be refunded if cancellations are recieved within 48 hours of scheduled visit. Groups that fail to cancel cruise reservations will be billed for the full amount.